A group of young pirates come from space to Earth to obtain the 'Greatest Treasure in the Universe' (å®‡å®™æœ€å¤§ã®ãŠå® UchÅ« Saidai no Otakara? ), which can only be acquired after obtaining the 'Greater Powers' of the different 34 Super Sentai Teams. However, they end up facing the Space Empire Zangyack, whose earlier invasion forces were wiped out by the 34 Sentai groups long ago before a new invasion force is established under Commander Warz Gill, the emperor's son. 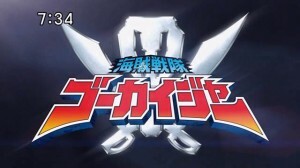 As a result, due to their history with the empire, the space pirates use the powers of the older teams and attempt to master their powers to fight the Zangyack forces as the Gokaigers.